writers say, I'm not alone. I can make a walk-on character come to life with a few casual phrases, but when it comes to describing myself, the only words that seem appropriate are "boring," "quiet," and "permanently tired." I've tried to write a scintillating bio. I really have. But it's not like I have a lot of material, you know? I don't have a cool day job to draw from. I have a lot of kids, so even though most of them are no longer at home, my primary activities are still cooking, dishes, and laundry. I have no hobbies. I do volunteer, but shelving books in the school library and singing in the church choir aren't much of a stand-out in Bio Land. But I may have a solution. 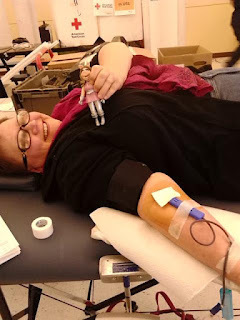 The other day, I was flat on my back on a skinny little table, waiting for the rather attractive young man beside me to finish the paperwork for my - you guessed it - blood donation. (Side note: if you are physically able to donate, please consider doing so. It takes about an hour all told, it hurts less than a trip to the dentist, and you get to save up to three lives. Plus there are cookies.) So Good Looking Guy and I are talking about pizza and wings and writing and little free libraries, and he has me squeeze my fist while he stares at my elbow, and then he says, "Yep, that's a good one." Because apparently I am the proud owner of a really Great Vein. But wait. It gets better! Because after Good Looking Guy swabs my arm with the iodine stuff, and gets my arm steadied and gets the needle in place (pinch, ow, oh that was fast), he fiddles with my tubes and jiggles the bag and says, "You're going great. You're a really good bleeder." And then - THEN - he makes more small talk and checks the bag and says, "You'll be done in a minute. That's a really great vein. I bet you hear that every time you come in." I didn't tell him that I was probably bleeding extra fast because he - being a Good Looking Guy - was making my heart beat a little faster than normal. (That would have been weird.) But I did tell him that I was going to use that in my next bio. So here it is: the next bio I will submit when needed. What do you think? Kris Fletcher writes about small towns, big families, and loves that grows despite them. She loves to read and cook. She is grateful to her family for all their support, and to the Great Vein in her elbow that enables her to whiz through blood donations. Bet no one will forget that! So come on, folks - it's your turn. What's the wildest thing you would put in your bio, if you were to write one? I do not have good veins, so that one is all yours. I could say something about the fact that I would rather walk than drive. I would happily walk all day, but driving scares me. Walking affords me the opportunity to daydream. Best avoided whilst driving. My veins are rollers, and the blood donation people don't like them. But that sounds a bit contrary for a bio so ... hmmm...Kristina has great olfactory senses - she can sniff out anything caramel or chocolate within a 5 mile radius! Kristina, LOL, I have that talent, too! Ever so handy, isn't it?